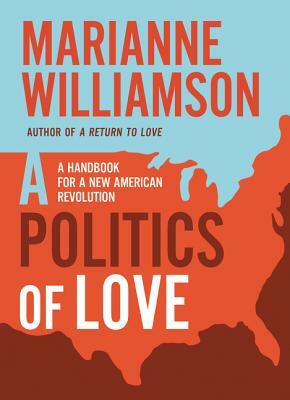 A Politics of Love: A Handbook for a New American Revolution (Hardcover) | Water Street Bookstore, Inc. In this stirring call to arms, the activist, spiritual leader, and New York Times bestselling author of the classic Return to Love confronts the cancerous politics of fear and divisiveness threatening the United States today, urging all spiritually aware Americans to return to—and act out of—our deepest value: love. Today, America once again is in turmoil. A spiritual cancer of fear threatens to undo the progress we have achieved. Discord and hatred are dissolving our communal bonds and undermining the spirit of social responsibility—the duty we feel toward one another. In this powerful spiritual manifesto, Marianne Williamson offers a tonic for this cultural malignancy. She urges us to imitate the heroes of our past and live out our deepest spiritual commitment: where some have sown hatred, let us now sow love. Williamson argues that we must do more than respond to external political issues. We must address the deeper, internal causes that have led to this current dysfunction. We need a new, whole-person politics of love that stems not just from the head but from the heart, not just from intellectual understanding but from a genuine affection for one another. By committing to love, we will make a meaningful contribution to the joyful, fierce and disruptive energies that are rising at this critical point in time. In the words of Abraham Lincoln, "we must think anew, and act anew . . . and then we shall save our country."